If you need a Marketing essay, especially something on 4Ps of Marketing Mix, here is a sample of our writing. You can order any Marketing topic with our writing service and quit worrying about your grades as long as you give us at least 8 hours to complete it. Marketing is the process by which the management of a company identifies, anticipates and satisfies the wants of a customer. The term Marketing Mix was coined by Neil Borden in 1953, building on James Culliton’s (1948) idea that for a successful marketing decision, a type of marketing recipe has to be employed. The 4 Ps of marketing mix stand for Product, Place, Pricing and Promotion. What are the 4 Ps of Marketing Mix? The 4 Ps are attributed to Jerome McCarthy. He explained these terms in 1960 as the main aspects connected to what is being marketed. However, these components must be mixed in the appropriate manner in order to market the product successfully. The product or service that is to be marketed must conform to the needs and wants of the customer. The quality and the content of the product must be carefully constructed for this end in view. The pricing of the product has to be attractive enough to the customers to help market the product. The correct market price has to be decided taking into consideration the product cost and the market demand for the product. 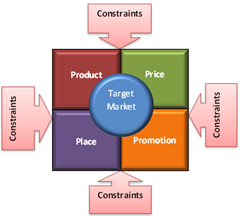 The placement or distribution of the product is very important in marketing it. The product must be available and conveniently at hand for the customers to be attracted into buying it. By building a network of distribution systems the customer’s easy access to the product is satisfied. The promotion or the advertisement of the product must be suitably planned to attract, inform and display the product for the scrutiny of the customer. The qualities of the product can be brought to the view of the customer through promotion. The 4 Ps are considered as old fashioned for today’s internet marketing strategies. There is a new strategy called the 4 Cs, that is an evolution of the 4 Ps. The 4 Cs stand for Customer needs and wants instead of Products, Convenience to buy replacing Place or placing, Cost to satisfy in the place of Price, and Communication instead of Promotion. The products that are offered by the company must be tailored to the specific needs and wants of the customers. In the same manner, the convenience to buy is a result of studying how the customers prefer to buy what they want, and supply the items to be available to them in those ways. Cost to satisfy includes the actual price, the cost of shipping it and the cost of the CSR aspects. While promotion was unidirectional and manipulative to the customer, communication is bidirectional and interactive. The customer can directly communicate his opinions to the seller. Marketing and Marketing Strategies have great importance in the study of Marketing Management Courses. Ideas for research paper topics such as the 4 Ps of Marketing Mix are available with our custom essays service. Our academic writing help can write custom papers for you if you are short of time.